Lenovo's got three new slates today, and they're going for a scattershot. The IdeaPad K1 is the first Android tablet "certified for Netflix"; the ThinkPad offers a biz-oriented dock (also, Netflix); and the IdeaPad P1. Which, uh, runs Windows 7. The 10.1-inch screened, half-inch thick K1, available today, looks capable enough for those who want muscle in a slate: dual-core Tegra 2 guts, Honeycomb 3.1, 1280x800 resolution, 2 MP front and 5 MP back cameras, and—hey now!—an SD Card slot. Like any other Android tablet. But it and the ThinkPad offer something no one else does: They're the first Android tablets pre-loaded with Netflix. Thank Christ. The ThinkPad otherwise is essentially the K1 in business attire—same Tegra 2 innards, same Android Honeycomb 3.1 soul—only pumped up with some enterprise security features, IT manager functionality, and eventually, 3G data. The ThinkPad also plugs into an optional port dock and keyboard, if you're down with the whole laptop lite thing. And then, there's the IdeaPad P1, arriving at the end of the year. Again, virtually the same internals (though it swaps out the Tegra 2 for an Intel CPU of unspecified provenance), but driven by Windows 7 Premium instead of Android. Windows 7 is totally fine! On a desktop or laptop. A desktop OS isn't made for a touch tablet just in the way that a phone OS isn't made for a touch tablet. Full releases for the trifecta, below. apps in the Android Market as well as apps tested for the Lenovo device in the Lenovo App Shop. 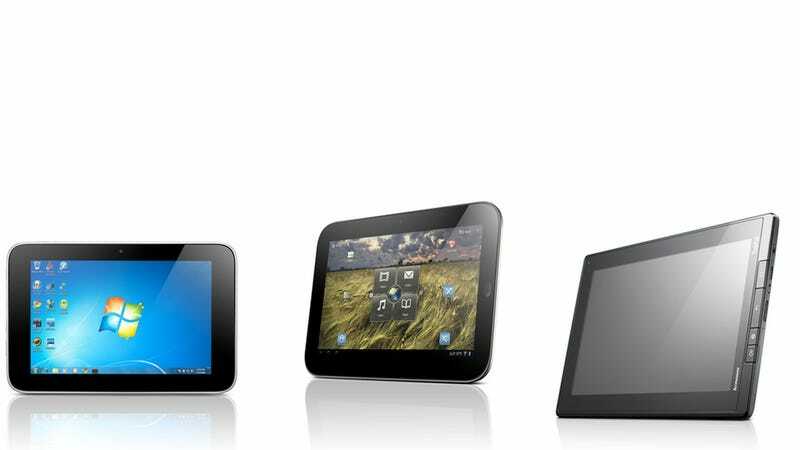 customers and are delivering Android tablets designed to meet their particular needs." "movie night." With a full 1080p HDMI output coupled with Digital Rights Management (DRM) built directly into the IdeaPad and ThinkPad tablets, Netflix members can instantly watch movies and TV shows streaming from Netflix directly to a big screen TV, "We're very excited to see that TV shows and movies streaming from Netflix, will be available on Lenovo's family of Android tablets," said Bill Holmes, Netflix vice president of Business Development. "This is not only an important development for our company as we seek to expand the benefits of our services to more people, it also means that consumers now have greater choice in selecting a tablet device that best fits their entertainment needs." after launch, users will also be able to buy movies via an Over-the-Air update. comes with a two-megapixel front-facing and a five-megapixel rear-facing webcam. monitor, resulting in a powerful visual experience. cloud storage, and less reliance on their hard drive. for premium function on the IdeaPad Tablet in the Lenovo App Shop. with the security, reliability and manageability features ThinkPad is known for, to create the first true businessclass tablet. Designed as a companion computing device for professionals on the go, the ThinkPad Tablet includes an optional digitizer pen, a full-size USB port, full-size SD card slot, and mini-HDMI for connecting to external projectors and displays, as well as an optional ThinkPad quality Keyboard Folio Case with optical TrackPoint. down notes that automatically convert to handwritten text with the optional ThinkPad Tablet Pen. accurate typing and mouse control. calendar notices all in one easy-to-use interface. is protected and the tablet is ready-to-go right out-of-the-box. be more productive with Office* documents, or get creative with photos while on the move. help businesses more easily integrate tablets into their daily operations. In addition, Lenovo will offer countryspecific applications, currency, and languages. through select business partners and retail stores nationwide, or via lenovo.com. The product will be generally available in the U.S. in August 2011 and generally available worldwide during the third quarter 2011. The 16GB ThinkPad Tablet is priced at $499 without the digitizer pen, and at $529 including the digitizer pen, for Wi-Fi models. There is also an optional keyboard portfolio carrying case available for $99. At a later date, shortly after launch, ThinkPad Tablets with 3G will become available.ThinkPad Tablet can be ordered in the U.S. starting July 20, 2011, online at lenovo.com or through business partners nationwide. The product will be generally available in the U.S. in August 2011 and generally available worldwide during the third quarter 2011. The IdeaPad Tablet P1 will be available in the fourth quarter 2011.
extend the IdeaPad product warranty for one additional year, and the ThinkPad Tablet for two additional years.